Jim started us off on Sunday, July 1, fencing Div 1A Men’s Epee. He struggled a bit in pools, coming out 157th with 1 victory and 5 losses, but he made the cut and won his first 15-point direct elimination bout 15-8. His next bout was 29th seed and he went down 11-15, ending up 128th out of 197 competitors. The next day, Jim was back for Vet-40 Men’s Epee. He did better in pools this time, going 3-3. He won his first direct elimination match (they only fence to 10 points in veterans events) decisively, 10-4. After that, he had a close match that was tied 8-8 when time ran out. In the priority minute, Jim’s opponent – the eventual winner of the event – scored a 9th touch and Jim finished 25th of 55. 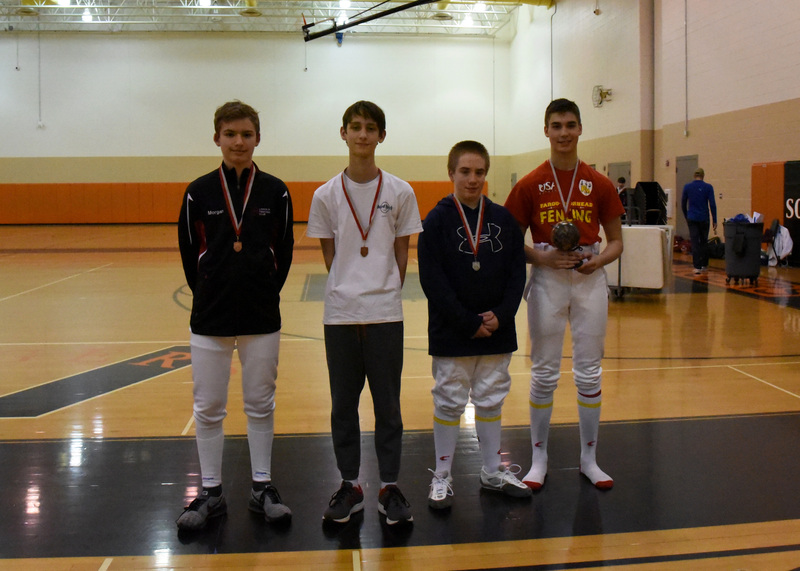 On Tuesday, Jared fenced Div 2 Men’s Epee, his first time competing in epee at the national level (his primary weapon is foil, but he’s been fencing epee with us when he comes home from college). He fenced well in pools, coming out tied for 51st with 4 wins and 2 losses. He got a bye into the round of 128, where he won his first bout 15-10. Then he fenced 14th seed and lost 11-15, which put him 45th of 226 overall. Sarah’s first event was Div 3 Women’s Epee on the 4th of July. One fencer in her pool dropped out due to injury, but Sarah won her other 5 pool bouts and was tied for 3rd thanks to a +20 indicator (“indicator” = touches scored – touches received). She won a string of direct elimination matches 15-6, 15-11, and 15-12 before losing 8-15 to 13th seed in the round of 16. She missed the medals by one place, ending 9th of 174. Jared also fenced Div 2 Men’s Foil on Wednesday morning, representing the Des Moines Fencing Club, and finished 146th of 223. Both Jared and Sarah fenced on Thursday, starting bright and early with Div 3 Men’s Epee at 8 am. Jared came out of pools 3-3, tied for 87th, but he stayed focused and battled back to upset 40th seed 15-12. He won his next direct elimination matches 15-11, 15-9, and 15-2 before going down 10-15 in the quarterfinals. He placed 8th of 183 and earned his first national medal! In Div 2 Women’s Epee, Sarah swept her pool again and came out tied for 2nd seed. She won two bouts 15-11 and then lost 12-15 in the round of 32, finishing 17th of 159. Kevin coaches Jared in Div 2 Men’s Epee at Summer Nationals in St. Louis. Jim (right) scores a touch in Vet-40 Men’s Epee at Summer Nationals in St. Louis. Jared earns the 8th place medal in Div 3 Men’s Epee at Summer Nationals in St. Louis. Sarah makes an attack in Div 2 Women’s Epee at Summer Nationals in St. Louis. Normally, a tournament has two rounds: pools and direct elimination or “DE’s”. For the first round, they split everyone up into groups of 5-8, and each fencer fences everyone in their group (or pool) to 5 points. Based on how a fencer does in pools, they are then seeded into a direct elimination bracket (like March Madness) for the second round. All of the direct elimination bouts go to 15 points, and if you lose, you’re done – you’ve been knocked out. At the Titanium Man, it’s one giant pool, and all of the bouts go to 15 points. There were 22 fencers this year, which meant that there had to be over 200 bouts fenced on 5 strips. We started fencing at 10:30 am and the last bout ended around 7:30 pm. It made for a long day, but it was good preparation for Summer Nationals! Jim lunges and hits an opponent at the Titanium Man tournament in Iowa City. Today, 6 fencers from RDF competed at Valley High School Fencing Club’s Bengal Invitational in Div 3 (D & Under) Mixed Epee. Jared won the event, Daniel A. was 2nd, Nick tied for 3rd, Carl was 5th, Alex came in 6th, and Daniel M. was 7th. There was a lot of fencing teammates, but it’s so nice to have another local event that’s easy for many of us to attend! VHSFC did great job organizing their first tournament. Full results available here: https://askfred.net/Results/results.php?tournament_id=40200. Daniel A. lunges at Carl during the direct elimination round. Alex and Nick face off in a 15-point bout. Daniel M. goes for his opponent’s hand. 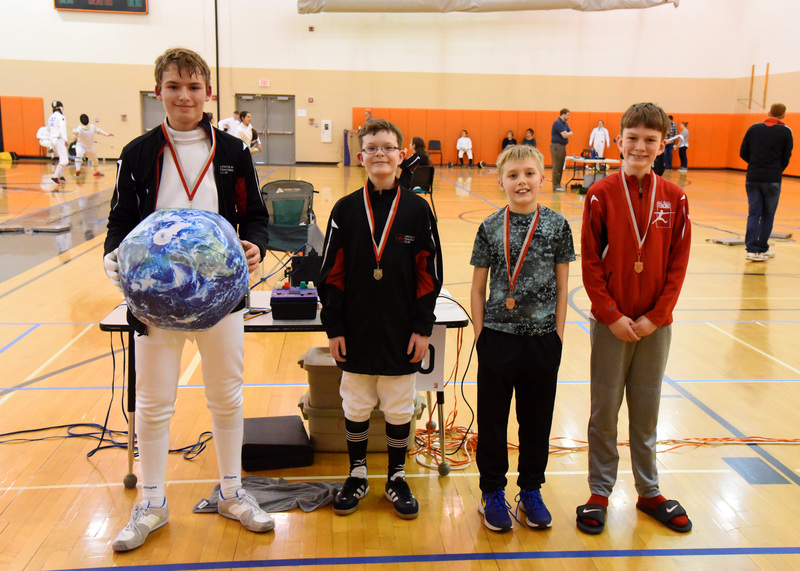 Last weekend, two RDF fencers traveled to Minneapolis for the Minnesota Open. Jim finished 10th and Sarah ended 14th in Open Mixed Epee. Full results available here: https://askfred.net/Results/results.php?tournament_id=37634. 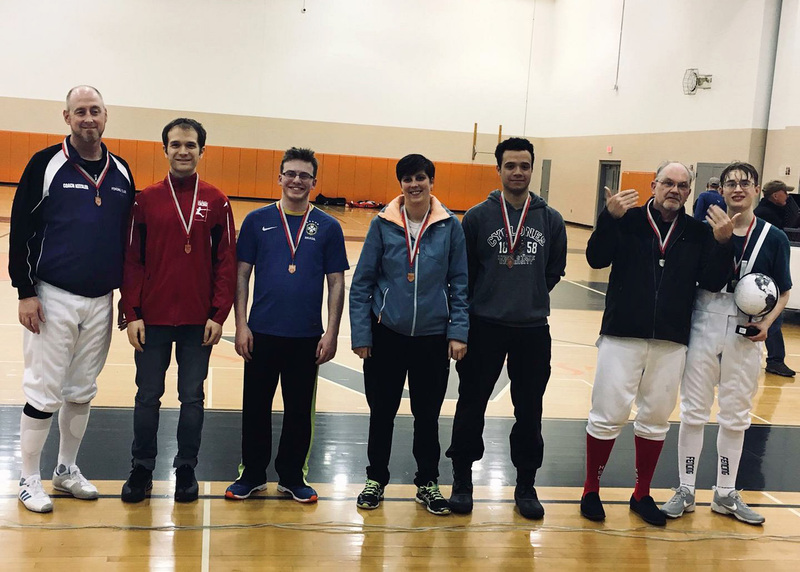 Last weekend, RDF hosted our annual Equinox Epee tournament at Valley Southwoods Freshman High School in West Des Moines. 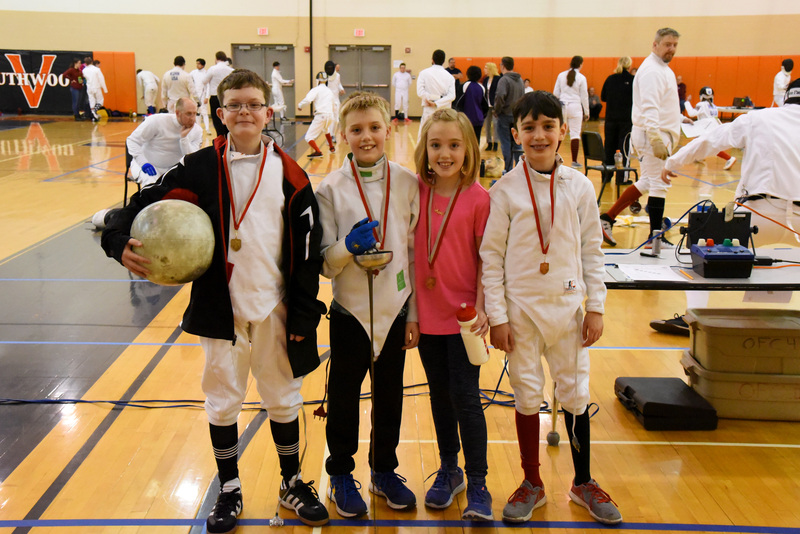 We’d like to thank all the athletes, parents, referees, and set-up/tear down volunteers for helping us make this our best Equinox Epee tournament yet! This past weekend, Jim and Sarah traveled to Kansas City to compete at the HFA Regional Open Circuit tournament. 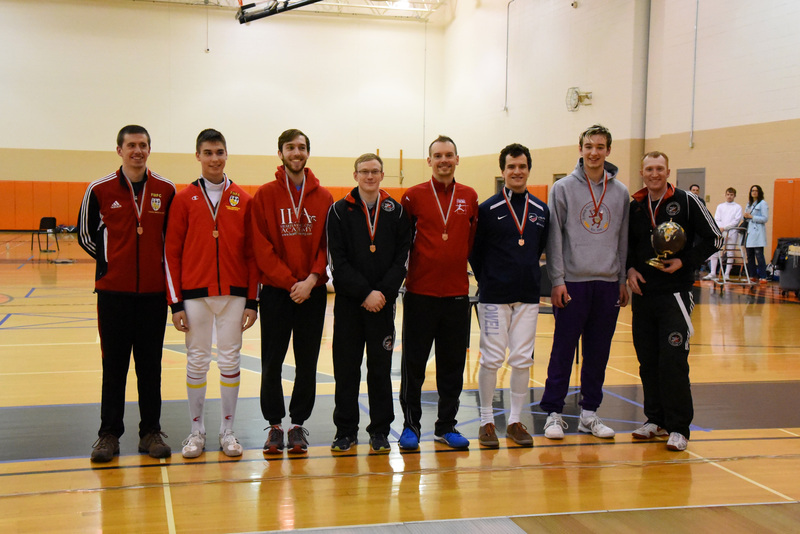 Jim finished 7th in Senior Men’s Epee, which qualifies him for Div 1A at Summer Nationals. Sarah tied for 3rd in Senior Women’s Epee on Saturday, and then she ended 2nd in C & Under WE on Sunday, which qualifies her for Div 2 & 3 at Summer Nationals. Full results: https://askfred.net/Results/results.php?tournament_id=37687.